At the intersection of 5th Avenue and Grandview Avenue lies Sweet Carrot, a fresh-casual restaurant unique to Columbus. Though Sweet Carrot opened in November 2015, owner Angela Petro is not new to the Columbus food scene. Through her evolution from bartender to cook to business owner, Angela has carved out a place uniquely her own in the booming Columbus restaurant scene. In fact, Angela is celebrating the 20th anniversary of her catering service, Two Caterers, this month. Angela, along with a talented staff, have gained a strong following at Sweet Carrot by serving up fresh, fast, and homemade comfort food. Everything is made from scratch: they smoke their own meats, make their own sauces, and bake their own bread, cookies, and cakes. The atmosphere, complete with a bunny motif, is bright and cheery, while the food is the definition of American comfort. It’s the perfect place to take a load off and relax. Sweet Carrot’s slogan is “smother your hunger” which encourages you to indulge in smothered corncakes, salads, sandwiches, and soups. You can get any of these options smothered in an array of different house-smoked meats, their famous Ohio chicken meatballs, or even the most perfectly fried artichokes. The menu lets you build-your-own meal, including the option to top it all off with house slaw, corn salsa, and homemade sauces. Or go the extra mile and get your dish of choice “loaded’ by adding a scoop of mac ‘n cheese on top for just $1.50. While Sweet Carrot is perfect for a quick lunch or a sit-down dinner with friends and family, it’s a little known secret that they also have an amazing happy hour. They have a variety of local Ohio beer on tap, which typically includes drafts from Rhinegeist, Mad Moon Cider, and Rockmill Brewery. Plus they have a small, curated wine selection that was chosen specifically to complement their smoked meats and bbq sauces, and a seasonal cocktail (currently: Cran-Apple Bourbon Mule with Watershed Bourbon). From 4 to 6PM every day of the week you can get a $1.00 off of smaller drafts and wine pours and $2.00 off 16oz drafts and 5.5 ounce wine pours! Check out the happy hour menu here. 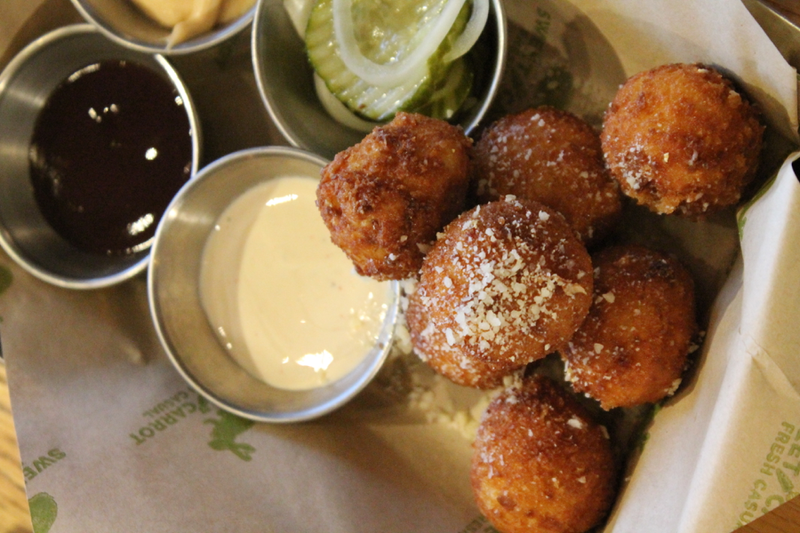 Speaking from experience, a nice cold beer pairs perfectly with Sweet Carrot’s mac n’ cheese ball appetizer, which comes with seven perfectly fried balls, bread and butter pickles, and your choice of white or regular BBQ sauce for dipping, yum! With the success of her creative comfort food, Angela is looking to the future with hopes to expand the menu and bar program in the coming years. She is definitely someone to be on the lookout for. In the mean time, swing by Sweet Carrot for your next happy hour and don’t forget to grab a made from scratch cookie or cake pop on your way out!